Hello, and welcome back! When you have a crack in your windshield, no matter how small or insignificant it may seem, it is imperative that you have the crack filled in as soon as possible. Having a crack repaired while it is still small can help prevent the crack from spidering out across the length of the windshield. A repair at the early onset of a crack will also help maintain the structural integrity of the windshield. 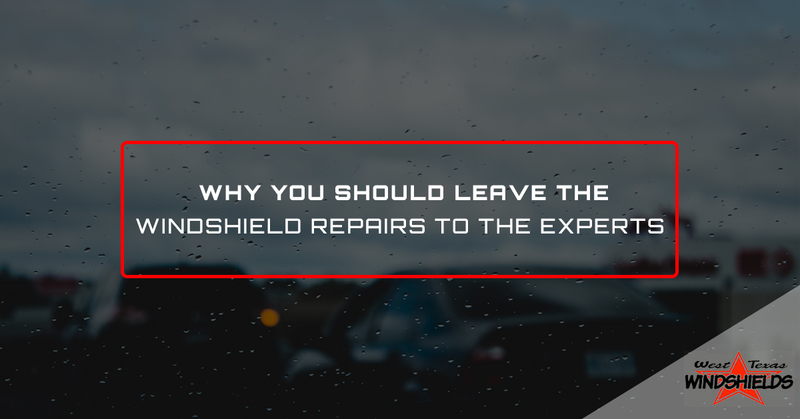 Therefore, when you have a damaged windshield, you have the option of repairing it yourself or bringing it into West Texas Windshields to complete a professional windshield repair. Attempting to repair a crack on your own may seem like a quick and affordable option, however, there are risk factors involved that you should be aware of as you weigh your options. Today, we will look at some of the issues that may arise when performing a DIY windshield repair. Please continue reading below. It seems as though everything these days is DIY. While the internet is flooded with instructional DIY videos for everything from home repairs to making your own shoes, some things, like a windshield repair, are best left to the experts. Fully accredited auto glass shops like ours are AGRSS certified, and only hire skilled and experienced windshield technicians who are educated and highly-trained in windshield replacement and repairs. Yes, DIY auto glass repair kits provide instructions and a few of the tools needed for the job, however, these kits do not supply you with the training and decades of experience that a qualified windshield technician provides. A DIY repair kit may seem like the most affordable option when you’re in a pinch, yet you might want to review your insurance policy before committing to a DIY repair. Most comprehensive insurance coverage on your vehicle will reimburse you for windshield repairs without you having to first pay the deductible. If the insurance company doesn’t completely cover windshield replacement costs, they may at least offer free chip and crack repair. Because accredited windshield companies like ours are backed by the proper certifications and employ only qualified technicians, insurance companies know expert repairs and replacements help ensure that a vehicle they insure is safe and well-maintained. Insurance companies don’t get these same assurances from DIY repair kits, and will not reimburse for DIY repairs. Your best bet, and most affordable option, is to bring your car in for a windshield repair with a professional. Along with lacking the experience, most don’t have all the proper repair equipment needed for an efficient auto glass repair. Yes, most DIY kits supply some of the tools, but they do not include high-quality resins and professional tools that professional auto glass shops like ours use. These tools and efficient resins ensure that a crack is filled properly for a lasting crack or chip repair. What is more, every single auto glass repair and windshield replacement we provide is backed by a lifetime guarantee, which DIY kits simply cannot match. Guaranteeing the quality of work and effectiveness of the products used for the repair provides car owners with peace of mind, and is cost-effective in the long run. If you have a windshield chip or crack that needs to be repaired, leave it to our skilled auto glass technicians at West Texas Windshields. We can help those located in San Angelo and the surrounding areas with all of your windshield repair and replacement. Get to know a little more about our family-owned auto glass company by clicking on this video link. To schedule a windshield repair, call us, your Top Rated Local® auto repair experts.